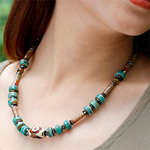 The gemstones jewelry artisans craft this unisex necklace by hand. The master artisans create the captivating design with unakite, grossularite garnet, DZI Tibet (agate), hematite, turquoise and brass beads. Fastens with a silver lobster claw clasp. Materials: Unakite, grossularite garnet, DZI Tibet (agate), hematite, turquoise, brass and sterling (.925) silver. This gemstone necklace is handcrafted by a family of jewelers who were academically trained as gemologists. They actively practice Usui-Tibetan Reiki (energy therapy), Quantum Touch and Crystal Healing. They work from their home in Bangkok.